We invite you to join us on October 20, 2016 as we celebrate the 20th Anniversary of the Academy for Professional Excellence. We will be highlighting significant milestones and recognizing some of our key partners who have supported our efforts to improve the quality of life in our communities. 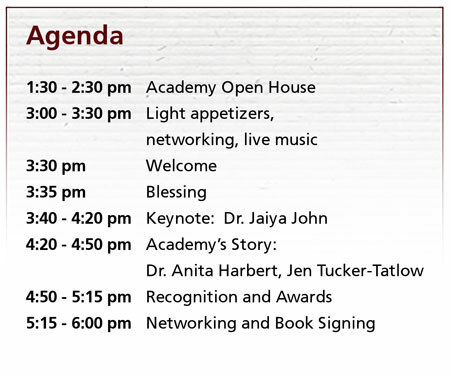 Dr. Jaiya John will be our keynote speaker. 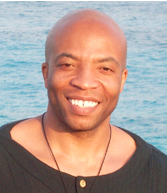 He will address the nature and impact of trauma in health and human service professionals, as well as how Story plays a vital role in our healing, wellness, and empowerment as practitioners. Story: not the details of our lives, but the meaning we gather from our journey. Learn how Story can help us to tap into our giftedness, purpose, and calling; how it can bond us with those we serve; and how it can feed the healing journey of our children, families, and communities. We will be giving out a few of Jaiya’s books as door prizes! Click here to download Jaiya John’s Your Caring Heart Seminar packet. Dr. Anita Harbert, Professor Emeritus, former Director, SDSU School of Social Work. success of the Academy during our first 20 years. RSVP by September 30, 2016. Show your appreciation and support by sponsoring premium seats at the VIP sponsorship table. 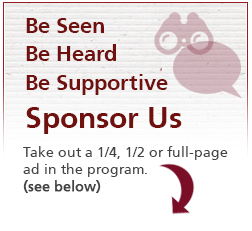 To sponsor the Academy, download the Sponsorship form by clicking the button below. Please send form to luis.murillo@sdsu.edu by September 20, 2016.